Musicians just love combining diverse cultural elements into creating fresh new sounds through instrumentation, rhythms, or lyrics. Live music has the ability to bring people together across cultures like no other art form. Some formats, like Blues, Jazz, Funk, and Reggae are especially welcoming to diverse ethnic and cultural flavors. After all, Blues was created when The Native American 4-beat rhythm was combined with African polyrhythms as a result of the coming together of African Slaves and Indians in southern Louisiana. Just like a pot of stew, there is an endless amount of flavors that can go into the pot, and an endless number of ways that those flavors can compliment each other. Music and song are at the roots of every spiritual tradition, as well as dancing and community gatherings. It has the ability to convey feelings, release grief, express joy, tell stories, or even be a prayerful expression of gratitude for life itself. Some musicians are able to draw on such universal themes that they attract audiences across genres and cultures. Bob Marley was one of these artists, a figure who transcended music altogether as a prophet, a spokesperson for the oppressed everywhere. Just as Louis Armstrong’s name has become synonymous with Jazz, Bob Marley is synonymous with reggae. 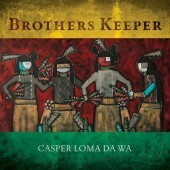 In The Southwest, Casper Lomayesva from The Hopi Mesas, has become synonymous with Indian Reggae. Casper is not afraid to sing about the troubles of modern life growing up on the reservation or the joys of being alive. One evening I was blessed to catch Casper in a quiet moment to learn about his influences, how a young man from Hopi was introduced to reggae, and the philosophy behind his music. Casper shares his journey of finding a balance between his traditional upbringing and embracing new forms of musical expression, while keeping his ties and respect to Hopi strong. You can learn more or “like” his Facebook fan page here.